Kiwanis International is a global organization of nearly 660,000 members dedicated to serving the children of the world. Kiwanis and its family of clubs annually raise more than $100 million and dedicate more than 18.5 million volunteer hours through 150,000 annual service projects to strengthen communities and serve children. Founded in 1921, The Kiwanis Club of Santa Fe was the first service club in Santa Fe and since that time, its members have been active in serving the youth and community of Santa Fe. 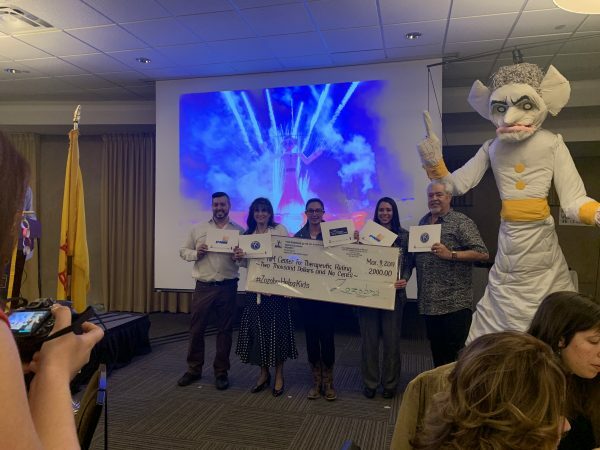 The Santa Fe Downtown Kiwanis Foundation disbursed $50,000 of the $70,000 net proceeds from Zozobra 2018 to nonprofits that were able to fulfill our Kiwanis mission of bettering the lives of children. NMCTR received $2,000 from the Santa Fe Kiwanis Foundation that will significantly impact the 72 total children and youth who participate in NMCTR’s four main programs (therapeutic riding, self-mastery program, school outreach program and high school interns) by supplying adaptive equipment, arena props, and lesson supplies. Implementation of each of these items will promote increased progress towards their individual riding and personal goals both in and outside of the arena. NMCTR’s Director, Ashley Armijo, attended a celebratory dinner on March 9, 2019 at the Drury Plaza Hotel at which NMCTR was presented with a check and an opportunity to enlighten the attendees on NMCTR’s services.